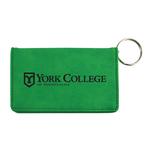 Hang onto your ID and keys with York College of Pennsylvania lanyards and key tags. 3/4" sublimated lanyard with black detachable clip and a keychain ring. 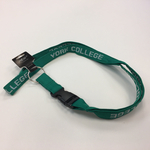 3/8" imprinted Lanyards with York College repeated. R&D Specialties Lanyard features the York College Spartan logo inside a mandala design on a 3/4 inch lanyard. R&D Specialties wristlet features the York College Spartan logo inside a mandala design. R&D Specialties 3" woven key strap features the York College shield and name.